The workplace has long been an enabler of Americans’ ever-expanding waistlines and according to an annual survey by CareerBuilder, the stresses associated with full-time employment will likely continue to contribute to the problem. Fifty-seven percent of U.S. workers feel they are overweight, up from 55% in 2014. 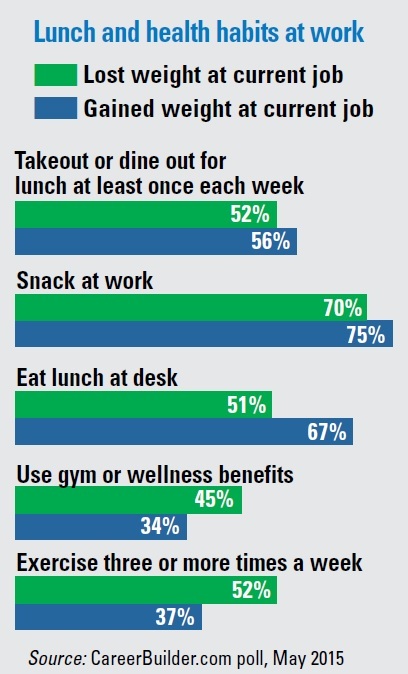 Additionally, 42% of workers say they’ve gained weight in their present job, up from 39% last year. Twenty-two percent reported gaining more than 10 pounds, while 16% of workers say they’ve lost weight. The survey reveals a strong correlation between on-the-job stress levels and overweight workers. Fewer than half of workers (47%) with extremely low stress levels feel they are overweight compared to 70% of workers with extremely high stress levels. That means workers with extremely high on-the-job stress are 49% more likely to say they’re overweight than workers with extremely low stress. Of course, personal habits at work can contribute to weight gain or loss, too.